Since 2006 the Prix de Dessin is awarded by the Fondation Daniël et Florence Guerlain. With the award the Guerlain’s want to stimulate contemporary drawing. 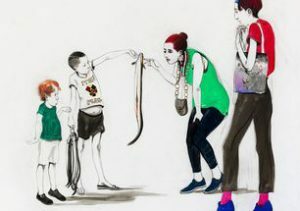 In the exhibition Auto Fictions – Contemporary Drawing at the Wilhelm Hack Museum in Ludwigshafen work of the winners and nominees of the award is now exhibited. Participating besides Marcel van Eeden (winner in 2011) and Martin Assig (nominated in 2014) are Tomma Abts, Dove Allouche, Mamma Andersson, Charles Avery, Silvia Bächli, Marc Bauer, Ulla von Brandenburg, Matt Bryans, Marcel Dzama, Vidya Gastaldon, Jana Gunstheimer, Susan Hefuna, Leiko Ikemura, Cameron Jamie, Tomasz Kowalski, Juul Kraijer, Frédérique Loutz, Thomas Müller, Ciprian Mureșan, Jockum Nordström, Hans Op de Beeck, Pavel Pepperstein, Javier Pérez, Jorge Queiroz, Anne-Marie Schneider, Didier Trenet, Marcel van Eeden, Catharina van Eetvelde, Sandra Vásquez de la Horra, Jean-Luc Verna, Jorinde Voigt, Amelie von Wulffen.